Imogene “Jean” Lauderdale, 84, of Herrin, went home to be with the Lord at 9:48 a.m. Saturday, November 24, 2018 at home surrounded by her loved ones and church members. Jean was born February 17, 1934 in Herrin, Illinois, the daughter of Ed and Edith (Johnson) Price. She worked as a retail clerk. 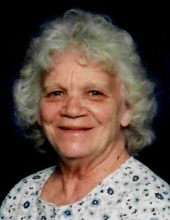 She is survived by son, Bill Lauderdale of Herrin; two daughters and a son-in-law, Karen and Danny Freyenberger of Cobden, Debbie Hilderbrand of Thayer, MO; sixteen grandchildren; several great grandchildren; several great great grandchildren; four sisters, Lenora Wagley of Herrin, Nancy Lauderdale of Texas, Wanda (Gary) Leffingwell of Ohio, Daisy (Raymond) Walker of Herrin; one brother, Tom (Brenda) Price of Herrin; several nieces and nephews and special friend, Mavis Reynolds. She was preceded in death by her husband, daughter and son-in-law, Sandra Jean and Marty Valco; parents; one sister, Myrtle Walker and two brothers, James Price and Melvin Price. Services will be 1:00 p.m. Monday, November 26, 2018 at Meredith-Waddell Funeral Home with Rev. Don Colson officiating. Visitation will be from 11:00 a.m. until 1:00 p.m. at the funeral home. Interment will be in Herrin City Cemetery in Herrin. and beckons with his hand. To send flowers or a remembrance gift to the family of Imogene "Jean" Lauderdale, please visit our Tribute Store. "Email Address" would like to share the life celebration of Imogene "Jean" Lauderdale. Click on the "link" to go to share a favorite memory or leave a condolence message for the family.